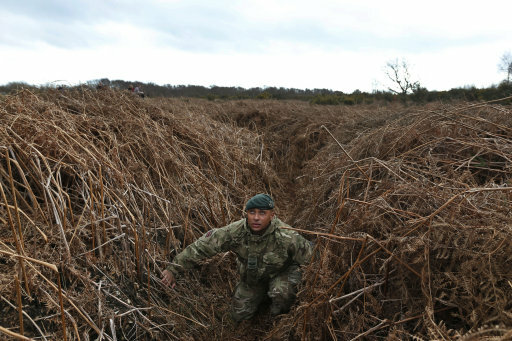 A "unique" set of trenches used as a practice battlefield for soldiers heading to the front line in the First World War have been discovered overgrown and forgotten in Gosport. 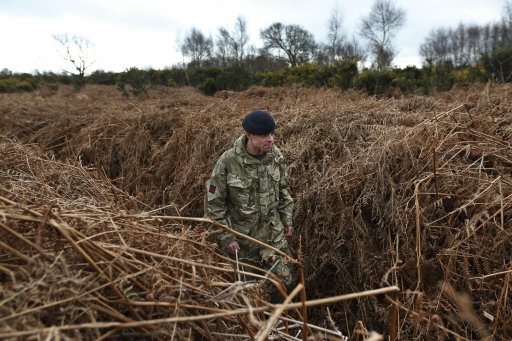 Historian Dan Snow has heralded the find on heathland in Historian Dan Snow has heralded the find on heathland near Browndown Camp as a significant reminder of the efforts made by the UK as it headed to war 100 years ago. The site, which is the size of 17 football pitches, contains two sets of opposing trench systems, each with a 200 metre-long (660ft) front line, supply trenches and dug outs with a no man's land in between the two sides. The site was discovered a few months ago by Rob Harper, a conservation officer with Gosport Borough Council, who spotted a set of strange lines on an aerial photograph from the 1950s and went to investigate. Mr Harper said: "I was looking for something else, I was looking for Second World War pillboxes and features associated with an airfield nearby and I came across this 1951 plan in the office of this area in Gosport and I couldn't believe it because in one corner of this plan was your absolutely classic First World War trench systems - it's quite jaw-dropping really, we are talking about an area of 500 metres (1,640ft) by 500 metres." He continued: "This is something that seems to be quite unique, we are at a time when we had our eyes on the western front, and that will continue to be case and rightly so, almost forgetting that on the home front there were many tens of thousands of men coming through sites like this, training ready to go straight out, you are only 48 hours from the trenches here, if not less. "Also, I am aware they were actually experimenting and thinking about how they develop the trench systems and this may well be to do with that, it was a constantly moving science." Mr Snow, who is president of the Council for British Archaeology, said: "What strikes me about this, to be honest, is the scale of it, I never thought I would see something this large in the UK. "To have the enemy and front lines, to have second lines, communication trenches, it's an entire replica World War One battlefield. "It shows how serious they took the business of training and how serious it was here, they had to send the guys out to France ready to do the hardest of tasks, something no-one had done before, that is to defeat the German army when they were dug in, they had deep trenches, they had pre-sited artillery, machine guns and how to break that deadlock, the answer is right here in front of us and that is massive, massive preparation with the resources required and what I love about it is they would have been in here, they would have been practising rotations, missing sleep, dodgy food, I think they would have been using live ammunition and just doing everything they could. 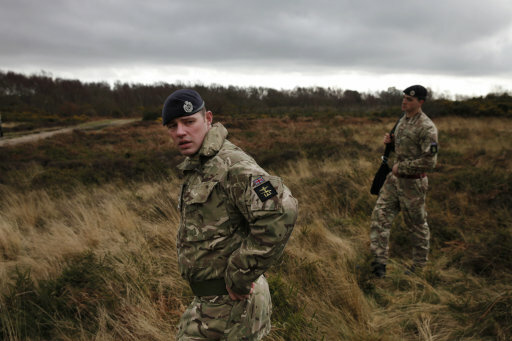 "I have been on British Army exercises where they do that to this day and it's something that was obviously born right here." No records exist about the training ground and Ministry of Defence archaeologist Richard Osgood, supported by David Hopkins, archaeologist for Hampshire County Council are surveying the site. Mr Hopkins said: "It is well-known that troops were stationed at nearby Browndown Camp but to date no historical records have emerged noting the practice trenches. "We need to use archaeological methods to investigate and increase our understanding of the site and the hugely important period in our history it illuminates." Assisting in the project are volunteers from the armed forces who are helping to map the site for the Home Front Legacy campaign by the CBA and English Heritage to document key sites around the UK involved in the war effort. Mr Snow said: "Our aim is to record and preserve vulnerable sites, buildings and structures - camps, drill halls, factories and observation posts for example, before they and the stories they bear witness to are lost forever. "Our volunteers will be scouring the nation's towns, villages, countryside and beaches to track down local First World War places that are just not in the records. "They'll upload observations on what they find to a specially designed app and their finds will appear on an online map to open up the impact of the war on our landscape for everyone." Wayne Cocroft, English Heritage's World War One expert, said: "English Heritage is rooting through old documents and archives, many of which haven't seen the light of day since they were put away after the war. "We're identifying former drill halls, requisitioned factories and farm buildings, pill boxes, secret listening stations, acoustic mirrors, prisoner-of-war camps and gun emplacements - places that deserve to have the part they played in history made known. "Buildings from Tudor, Georgian, Victorian times, these are all well-documented but the built history of the First World War in England is virtually a blank chapter. "The Home Front Legacy 1914-18 campaign is about bringing together our national expertise and people's local knowledge to fill in the gaps and for the first time properly record the remains of the war that are still all around us today." Maria Miller, culture secretary and the Government's lead on the First World War commemorations, said: "The Home Front Legacy 1914-18 will have a lasting benefit in that the most significant buildings and sites discovered will be listed or scheduled. "And all the sites recorded will be added to the publicly accessible Historic Environment Records held by each local authority. "So I hope lots of people will get involved." Gosport, a coastal peninsula in Hampshire fronting on to the Solent, was the departure for more than 20,000 soldiers setting off to the trenches in Europe. An English Heritage spokeswoman said that there were a total of 14 registered practice World War One trench systems in the UK.